Signing off for 2008. 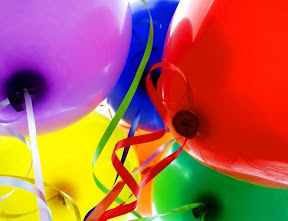 Everyone thanks for reading and have a great new year! See you in 2009! 8. ‘Botnet' attacks put school computers under hackers' control. 7. The power of online video is a force for good--and bad. 6. A landmark cyber-bullying case inspires new laws--and raises awareness of a growing problem. 5. The RIAA scores huge wins ... and then alters its strategy to combat illegal file sharing on campus. 2. Rising costs, and a tanking economy, hammer schools--forcing several key changes in behavior. 1. President-elect Barack Obama's historic victory signals a shift in federal ed-tech policy. If you’re like me, odds are that you’ve also found yourself with a tech problem that was made worse by the lack of ready, available — and perhaps most important — useful help. But with the Internet, there’s no need to have to wait on hold. There are hundreds (if not thousands) of other users out there, sharing their experience and wisdom, often free. So instead of getting on the phone, get online and start crowdsourcing your tech support needs. First, a few general rules. Many of the below sites require you to register a user name and password before you can post a question. Also, it’s a good idea to check how active a site is. Answerbag.com, for example, has more than 750,000 members. 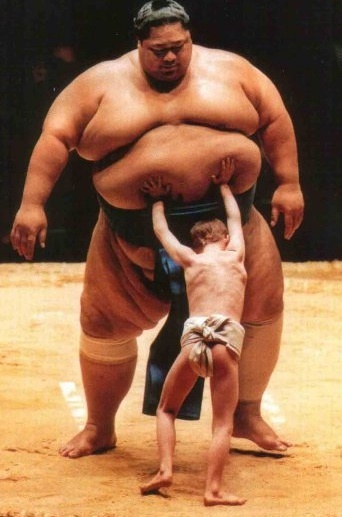 The bigger the site, the more likely you are to get an answer. Sites with moderators are a plus because they will help weed out irrelevant or duplicate answers and keep the discussion on topic. There are also good fee-based sites like Experts Exchange (secure.experts-exchange.com/), but I’ve limited the below list to free help. Welcome to the greatest free presentation sharing community in the world. Here you can upload your presentations and share them with your friends (publicly or privately). You can even add video and/or audio by recording it directly within the site! I'll spend a bit more time on the site and post a quick review and comparison with slideshare and other similar services. Taken individually, these all seem like isolated security holes. But when viewed together, these three separate stories make me question the safety of online data, the state of user privacy, and the immediate future of cloud computing. In a paper published Tuesday, Ms. McKinley found particular problems with Safari and concluded that none of the four major browsers extends its privacy protections to Adobe’s immensely popular Flash plug-in, which is used to display Web animations and video. 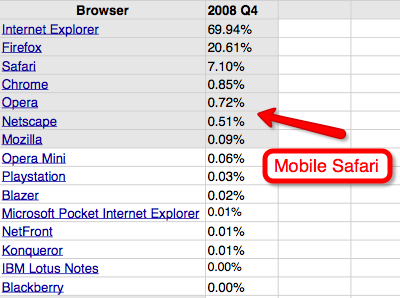 Apple’s Safari fared the worst of the browsers in Ms. McKinley’s tests. When used in “private browsing mode” on a Macintosh running OS X, Safari was “quirky,” Ms. McKinley wrote, accessing some of the cookies previously stored on her computer, but not others. When used on a machine running Windows XP, Safari’s private browsing mode was not private at all -– it accessed previously set cookies and did not delete any new ones. A team of United States and European computer security researchers have used a cluster of several hundred Sony PlayStation 3 video-game machines to exploit a basic weakness in the software system used to protect commercial transactions made via the Internet. The attack is possible because a handful of commercial organizations that provide components of the basic security infrastructure of the Internet are using an older security technology — despite years of warnings that it is now potentially obsolete. The flaw would make it possible for a criminal to redirect a Web surfer to a fake bank or online merchant without being detected by the security mechanism embedded in today’s Web browsers. It could also be used to subvert e-mail communications and other applications that use cryptographic software for authentication and security. The demonstration underscores that the commercial infrastructure of the Internet, as well as its privacy and security, are based on an advanced branch of mathematics that in the future may become vulnerable to more powerful computing systems and more clever attackers. Today’s browsers display a tiny image of a padlock when a user has a secure connection to a Web site. This is intended to provide evidence that the Web site is legitimate, as the browser and the site exchange digital certificates provided by a certificate authority — a trusted third party. Researchers have proved they can create fake certificates that will be accepted by the security system. In July of this year, Google finally gave webmail users a way to make sure that Gmail always used SSL - the protocol that encrypts connections to prevent hijacking. Through a flip of switch in Gmail's settings, users could rest assured that their email was at least less vulnerable, if not totally secure from hackers. However, Gmail is not the only Google-based web application where you may be storing personal data. Your files stored in Google Docs should be protected, too. But are they? For many users of Google Docs, that answer is "no." According to Google's Help Topic on SSL as well as their Google Apps Edition comparison guide, SSL is a feature only made available to users of Google Apps Premier and Education Editions. However, in some informal testing on our part, it appears that users of Google Apps for Your Domain were given that option as well, despite the fact that their Google Apps edition clearly reads "Standard." For everyone else, though, Google Docs remains an unencrypted HTTP session. This list could also be called, “50 Reasons to Become an Engineer.” They work hand in hand. With a little creativity, any one of these reasons can become a lesson or discussion about engineering careers and serve as a catapult to further exploration. 1. 48 countries (2.8 billion people) could face fresh water shortages by 2025. 2. To save the rainforests. 3. Population in developed countries will age and engineers can help develop assistive technologies so aging people can maintain healthy, productive lifestyles. 4. To give the underserved a clear path to family wage careers. 5. To give students whose talents lie with the concrete rather than the abstract an avenue to success. 6. To make sure students who excel at abstract academics can make the transition to concrete applications and specific problem-solving. 7. To give women another venue for success. 8. To enlighten students who don’t know what engineering is about. 9. To save rare or exotic animals from extinction. 10. To educate a potential President of the United States. Almost every time I present at a conference or attend an engineering event, a school district administrator or teacher asks me what engineering programs or curriculum are available. Usually, this person is charged with the responsibility of implementing a standards-based engineering academy or program in their school or district. They invariably want something easy, proven and engaging for the teachers and students. If you want to know what is going on in engineering education around the United States, this list is for you. However, it's not all-inclusive. These are just a few of the more popular approaches to implementing engineering at the K-12 level. 1. Engineering the Future (EtF): Science, Technology, and the Design Process (www.keypress.com/etf) is a laboratory course for the first year of high school science, created to help a broad spectrum of students. EtF is a full-year lab course organized around four projects, each of which is divided into several tasks. The entire course can be implemented on a modest budget. 2. Engineering is Elementary - This project develops curricular materials in engineering and technology education for children in grades K-5 (www.mos.org). Educator support includes lesson plans, assessment materials, and professional development programs that tie into other major content areas, including science and language arts. 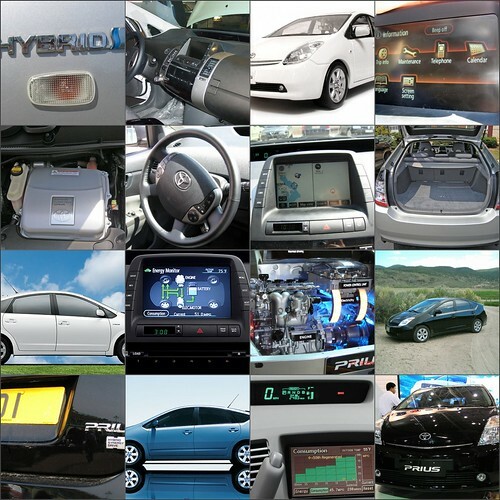 You should take a look at Yugma (www.yugma.com). Yugma's free version allows you to share your desktop with up to 10 others while using the built-in instant message features. Great point Rebecca, thanks! There are a ton of free and open source alternatives to paid services and applications. 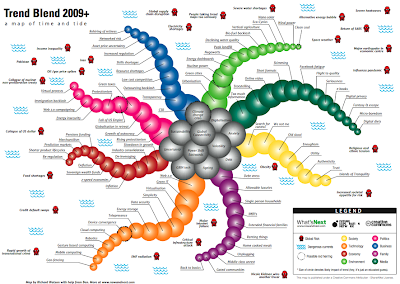 In an earlier post - UPDATED: Educational Uses of Web 2.0 Based Applications - I pointed to Yugma and a number of synchronous learning tools. Interesting story - Apple iPhone Browser Share Jumps 36% Christmas Week (AAPL) - from Silicon Alley Insider. While this number 36% jumps out at you, consider that it represents an increase from .42% to .57%. While I have no doubt that there are a huge number of users using the iPhone and iPod Touch to browse the web, I'm not sure that these numbers really tell the story. A more appropriate measure would be to see the growth trend, and to compare the market share with other browsers - particularly mobile browsers. Here's a figure I created from 2008 Q4 data Net Applications. You can see that while a .57% share seems small, it is an order of magnitude great than the nearest mobile browser competitor - Opera Mini. It will be interest to see what happens to the Blackberry share - currently statistically insignificant. I would expect the numbers to spike with sale of the Blackberry storm. Some more data suggesting that Apple's (AAPL) iPhone had a good Christmas: Its browser market share jumped 36% last week, according to Net Applications, a Web stats company. Specifically, the iPhone's browser share increased to 0.57% for the week ending Dec. 27, up 35.7% from a 0.42% share the week before. It's also up more than 50% from the iPhone's November average 0.37% share, Net Applications says. The company does not have year-over-year comparisons. Many people probably got new iPhones in late December, especially around Christmas. Many people probably used their iPhones to surf on the Web Christmas week, including people with brand-new phones and people who already had iPhones but were home from work. Many people probably used their work PC less on Christmas week, so at-home devices and mobile devices like the iPhone probably got an extra boost. How much time are you spending in social networks (Facebook, MySpace, Twitter, Friendfeed, etc)? Are these networks making any money? I am fairly active in Twitter and Facebook, but these interactions haven't been monetized. In other words, these social networks aren't making money from me. Also, I find that my colleagues and I are early adopters. If I took a cross-section of family members and colleagues my age or older, I would venture to guess that probably only 10% are active in social networks - not very significant market penetration. Where's the money coming from? Is this just a house of cards ready to collapse under the weight of a strugglig economy? Technology Review: Are Social Networks Sinking? The air seems to be coming out of the Web 2.0 bubble, squeezed by the economic downturn and the absence of many solid short-term business plans. Dire market conditions have forced virtually all social-networking firms to scale back. In October, the third most popular social-networking site, Hi5, announced that it would cut between 10 and 15 percent of its staff. And in November, the business-focused networking sites LinkedIn and Jive said that they would slash their workforces by 10 and 40 percent, respectively. The dominant social-networking sites are certainly better equipped to weather the storm: MySpace and Facebook have estimated revenues of $750 million and $300 million, respectively, while LinkedIn is expected to pull in between $75 million and $100 million this year. However, the overall value of these companies is still largely based on growth potential, which now seems shaky. Microsoft's investment in Facebook valued the company at a massive $15 billion. But in November, Twitter refused to be bought by Facebook for a reported $500 million of its stocks plus some cash. In the fine print of a jobs report published today is some mixed news for Silicon Valley. For the first time in this downturn, the region lost jobs; it has 4,000 fewer jobs than it did a year ago at this time, and its unemployment rate is 7 percent, according to the Center for the Continuing Study of the California Economy, which analyzed the California Bureau of Labor jobs data. Great comparison of synchronous learning systems Breeze and Elluminate from the Journal of Online Learning and Teaching. I've used both. Each is a great choice. As bandwidth continues to increase and high-speed broadband Internet becomes more-widely available, I think we will see more and more synchronous teacher-student and student-student interaction. Elluminate even offers a free v-room (virtual room) that will host up to three participants. While three participants doesn't make for a class, it does allow you to begin integrating synchronous learning into your online and face-to-face classes - for free! Synchronous, virtual classroom systems can provide high levels of interaction for distance learning initiatives. With the rapid evolution of technology,continuous product evaluation is necessary to ensure optimal methods and resources for connecting students, instructors, and educational content in rich, online learning communities. This article presents the analysis of two online, synchronous learning solutions (Elluminate Live and Breeze),focusing on their abilities to meet both technical and pedagogical needs in higher education. To make a solid comparison, the systems were examined in online classrooms with instructors, guest speakers, and students. Pros and cons relative to usability, instructional needs, technical aspects, and compatibility are outlined for both systems. With just days to go before the annual Macworld trade show, a second case maker has added references to an iPhone nano to its website. Well-known case designer Vaja has joined XSKN with an update to its web catalog implying that it plans to deliver protective garments for an Apple-developed iPhone nano in the near future. The single reference to the product links customers to a web form where they can "sign up for the upcoming release" of its "iPhone nano cases." Every time I take a vacation, the day before I return to the office is tinged with regret for taking time off. I enjoyed my time off, oh yes. But I know that when I come back, I'm going to have to tame the email beast. I always set my OOF message before I go. I add recurring all-day events to my calendar for the days that I'm gone. I have to admit that I do check my email at least a couple of times while I'm gone, but I don't read it nearly as much as when I'm in the office. 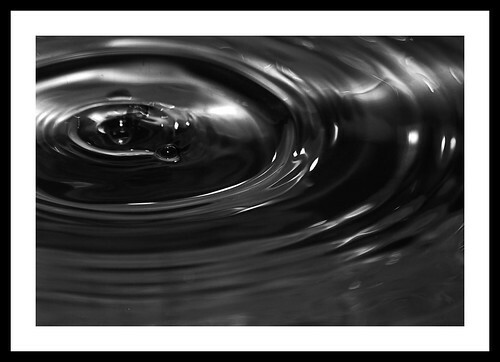 In January, after the holidays and Macworld Expo, many people have this collective fear. I've adopted a few strategies in Entourage that help me get through all of that email. First, I check everything by priority to make sure that there's nothing in there marked urgent or that is flagged, and deal with those from most recent to least recent. If I've been gone for awhile, I've found that items that were marked urgent but sent more than a couple of weeks ago have usually resolved themselves, often by the sender following up with someone specified by my OOF message. Next, I take care of my calendar invites, to make sure that no-one has scheduled something for me early in my return. There's always someone who schedules a meeting with me a couple of hours into my first day back, and I'd rather that they get a response from me instead of radio silence. Then, I sort my inbox by sender. Some senders are more important than others —-- for example, emails from my manager are the most important ones. This also lets me delete all of those Facebook emails that arrived over my break. I get a lot of email for stuff that I need to do, but those tasks are often pretty quick, so this usually lets me pick off those low-hanging fruit quickly and easily. After I've done this, I sort my inbox by conversation. Next, I scan through them and prioritise the conversations. Some of that is simply by reading subject lines. Also, I usually check conversations with lots of responses first. Then, I read the most recent email in that conversation. This often means that the whole email thread has been taken care of by the time that I got back, so I can just delete all of the emails in that conversation. Between these, I've usually deleted lots of emails, and dealt with the highest-priority and easiest-to-handle stuff. Now it's time to really dig in. I have a lot of projects going on at once, so the next thing that I do is sort my inbox by category. I have an extensive address book, and all of the senders in there are categorised, so the vast majority of what ends up in my inbox already has a category (if you're not like me and don't like that, you can turn it off). I start off with the email that isn't categorised and take care of it as quickly as I can. Then I decide which of the categories is the most important, and I work through those emails. I tend to work from most recent to least recent for long vacations (more than a couple of weeks), and the reverse for short vacations. And so on and so forth, until I reach the goal of Inbox Zero (no emails at all in my inbox). Great iPhone app from http://www.gamez4touch.com/. It's put together as a game, but uses physics to complete each level. Great way to get kids interested in science. On sale for $0.99 at the iTunes app store. This example is from the UK, but should be our model for integrating mobile phones into the classroom. You can also read the cell phones section of my post UPDATED: Educational Uses of Web 2.0 Based Applications and a related post Does Your School Have a Mobile Learning Initiative? reporter Anna Lacey went to Park House school in Newbury, where they have been experimenting with the use of mobile phones in school. Instead of banning phones and giving detention to any student foolish enough to take out their mobile in class, the school has been part of a nine-month research project into whether they can be used effectively in teaching. The results are interesting to those of us who have seen how our children embrace new technologies. During 2007 and 2008 Dr Elizabeth Hartnell-Young from the Learning Sciences Research Institute at Nottingham University and her colleagues explored ways in which students in five secondary schools could use smartphones in class. They started from the premise that mobile phones are now "small, personal computers, providing clock, calendar, games, music player, Bluetooth connection, internet access, and high-quality camera functions in addition to voice calls and short messaging", and decided to find out whether they had a role in class. The conclusions were hardly surprising. During the nine-month experiment, the range of activities that the smartphones could be used for was impressively broad, from timing experiments to listening to foreign language podcasts to accessing the school's student support system remotely. Some students even recorded their teacher reading a poem to use for revision. Great stuff from Jim Carroll. What does 2008 look like on January 1, 2015? I'm a big believer that we live in truly transformative times, and that the next decade is going to witness some pretty staggering changes. 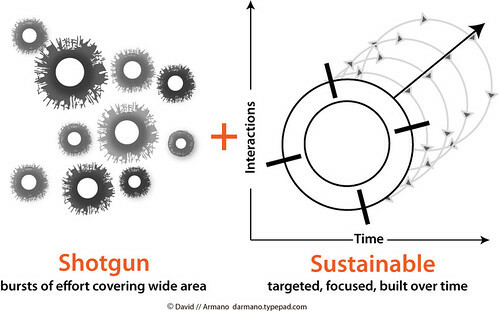 Much of this transformation will come about because of the scope of potential problems that loom. Health care is an obvious huge problem, and the World Healthcare Innovation & Technology forum that I keynoted last week featured hundreds of innovative ideas. In 12 years, the health care system will look nothing what it looks like today. If you want a sense of what that is, read the healthcare trends post I did a few weeks ago. The manufacturing sector is in a transformative period. We'll see significant change because many of the assumptions of slow-paced manufacturing are dead; We'll see fundamental business model change -- think GoogleCar, a concept I've been speaking and writing about for some time. Energy and the environment. The linkage of these two issues is a great big step, and this will speed up the pace of scientific discovery, spawn new industry, and nurture growth. Pervasive connectivity. Device and location intelligence are at the tipping point. Think smart highway infrastructure, and other fascinating mass-connectivity infrastructure. I could go on. The point is, take any of these issues or dozens of others, and we'll look back in ten years and think to ourselves, '"wow, there was suddenly a whole lot of innovative thinking going on." Here's more on innovation in manufacturing, the google car here, and here. On New Hampshire public radio’s Word of Mouth, Don Tapscott and Mark Bauerlein debate how kids are faring in this plugged-in world. Bauerlein insists the Internet is making kids dumb. Bauerlein is professor of English at Emory University and author of "The Dumbest Generation: How the Digital Age Stupefies Young Americans and Jeopardizes Our Future (Or, Don’t Trust Anyone Under 30)". Should Teachers Become Virtual "Friends" With Their Students? Interesting question from a story in the Houston Chronicle. This is real uncharted territory. The story does mention an inappropriate Facebook exchange between a 42-year-old former high school aid and a 16-year-old former student. The story depicts such stories as "rare" - but I don't really know if that's the case or not. I'm not sure anyone knows for sure. I am in facebook and I am "friends" with current and past students. I am very careful with what I post on facebook - my students, not so much. I have made it a policy not to seek out students, but instead let them request me as a facebook friend. Students have told me that it can be "creepy" to have a parent, teacher or other adult in facebook. I'm not using facebook in an official school capacity, instead I use it to interact with colleagues, friends and family, and current and past students. There's a lot of value in these interactions, but like any technology, we have to be aware of the potential misuse. Can teachers be students' Facebook friends? What seems like an easy question — Will you be my friend? — is not necessarily so for teachers who have joined the Facebook phenomenon. The social-networking Web site, whose popularity has grown from the college crowd down to teens and up to boomers, poses a prickly question for teachers who want to connect with their tech-savvy students yet maintain professional boundaries. I've posted quite a bit about e-books and mobile e-books, particularly focusing on the Amazon Kindle and the Apple iPhone. Jorge Pinto of PintoBooks weighs in on the iPhone's new eBook offering. He says he's selling more eBooks for the iPhone than the Kindle (which may have something to do with the lower price). Enjoyed reading Dan Frommer's article describing the iPhone as a viable challenger to the Kindle. As a small niche publisher with more that 50 titles in print (all copyright protected), I have been looking at ebooks for a long time. I try to get from my authors / agents electronic rights to use them at the right time. I currently have 5 titles in Kindle and in the iPhone. Printed editions are between $15.95 and 19.95, in Kindle are $9.99 and in iPhone $5.99 and some in future titles $7.99. Sales in iPhone have being great and steady. Kindle no so good. I look forward to a larger size iPod or eReader from Apple since I have many copyright works to be published. Olivia Mitchell left a great comment about Garr Reynolds agenda (slides 7-12). I agree, great technique! Thanks Olivia! Garr Reynolds uses an innovative agenda slide in his web presentation. See slides 7 to 12. I like how it visually represents the time he intends to spend on each section of the presentation. He also uses colour to indicate which is the most important section. 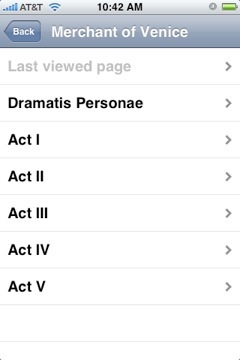 Here's a quick preview of a free iPhone app Shakespeare, which provides access to the complete works of William Shakespeare on the iPhone. 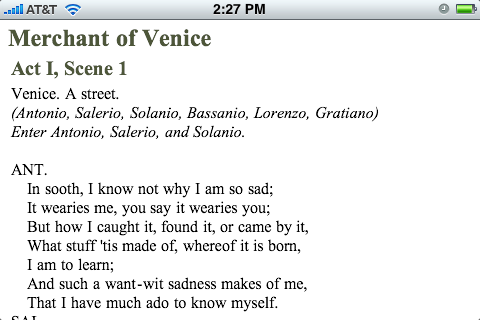 I took a Shakespeare class in college - I remember lugging around the huge anthology. This is a great improvement, it's free and it's searchable! We start with a clean, typical iPhone interface, which provides access to About, Settings, Search and text of all of the works. 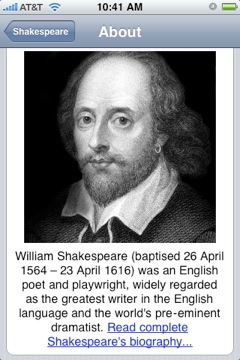 and a picture and brief bio of Shakespeare. 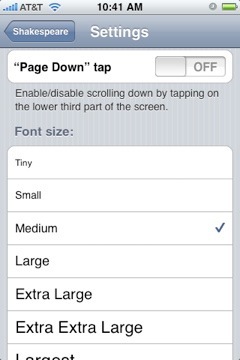 The settings allow us to control text size and to use tap to move from page to page. 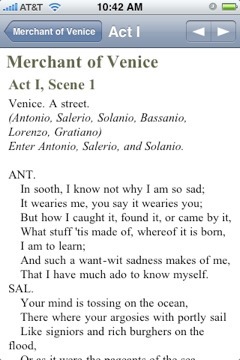 Here's what "The Merchant of Venice" looks like - you can access each act individually. - and as you would expect, you can rotate the iPhone to get this view. 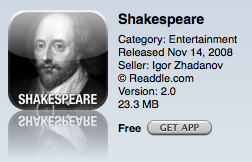 Finally - don't forget Shakespeare's poems and sonnets - they're here too. These kids have it so easy today! Going to the inauguration next month? Planning to send a photo from your cell phone to your friends back home at the moment Barack Obama takes the oath of office? The nation's wireless providers hope you'll reconsider. Providers are boosting capacity in and around the National Mall to try to meet the demand of a crowd that is expected to exceed 1 million and may be much higher. But the industry warns that some dropped calls and delayed transmissions will be inevitable. "If 4 million people show up on the Mall, absolutely expect delays," said Joseph E. Farren, a spokesman for CTIA, which represents the wireless industry. Sprint said Tuesday that it plans to increase wireless capacity by 40 percent for cellular service and 90 percent for its walkie-talkie like feature. T-Mobile's preparations exceed those of any single-day event in the company's history, according to company spokesman Peter Dobrow. Verizon Wireless, a big local player, referred questions to the industry association. CTIA is suggesting that people avoid sending videos and photos from the scene, and send text messages instead of phone calls when possible to place less strain on the network. and here's a link for the recording of the webcast. You'll have enter your name and email address, but it's available for free and well worth the time and effort. You can even download the presentation, although you'll have to download the free WebEx WRF Player. Here some additional great presentation tips from Ian McKenzie - 10 Tips for Effective Presentation Visuals. Use visuals sparingly. One of the biggest problems in technical presentations is the overuse of visuals. A useful rule of thumb is one visual for every two minutes of presentation time. Use visuals pictorially. Graphs, pictures of equipment, flow charts, etc., all give the viewer an insight that would require many words or columns of numbers. Present one key point per visual. Keep the focus of the visual simple and clear. Presenting more than one main idea per visual can detract from the impact. Make text and numbers legible. Minimum font size for most room set-ups is 18 pt. Can you read everything? if not, make it larger. Highlight the areas of charts where you want the audience to focus. Use colour carefully. Use no more than 3-4 colours per visual to avoid a rainbow effect. Colours used should contrast with each other to provide optimum visibility. For example, a dark blue background with light yellow letters or numbers. Avoid patterns in colour presentations; they are difficult to distinguish. Make visuals big enough to see. Walk to the last row where people will be sitting and make sure that everything on the visual can be seen clearly. Graph data. Whenever possible avoid tabular data in favour of graphs. Graphs allow the viewer to picture the information and data in a way that numbers alone can’t do. Make pictures and diagrams easy to see. Too often pictures and diagrams are difficult to see from a distance. The best way to check is to view it from the back of the room where the audience will be. Be careful that labels inside the diagrams are legible from the back row also. Make visuals attractive. If using colour, use high contrast such as yellow on black or yellow on dark blue. Avoid clutter and work for simplicity and clarity. Avoid miscellaneous visuals, If something can be stated simply and verbally, such as the title of a presentation, there is no need for a visual. Demand for Apple’s iPhone 3G rose rapidly over the past year and should remain steady heading into 2009, according to a survey by Rockville, Md.-based ChangeWave Research. The survey of 3,803 ChangeWave “alliance members” was conducted Dec. 9-15 and looks at trends in the smart phone market, particularly regarding the iPhone and Research in Motion’s BlackBerry Storm. Launched in November, the Storm is RIM’s first touchscreen smart phone. So far it doesn’t look like the Storm has harmed iPhone sales in any significant way. The current market share chart (based on which phone respondents currently own) shows the iPhone climbing from 6 percent in January to 23 percent in December. And that’s up from 17 percent in the September survey. Meanwhile the BlackBerry has been rock-steady. Its share in January was 43 percent; in December, 41 percent, down 1 point from September. Today’s youth, the Net Generation, is increasingly comfortable with exchanging real life experiences for virtual ones. The latest is the annual college tour that many high school students undertake before selecting a post secondary institution. While their parents would take the time and incur considerable expense to visit the few colleges that they were interested in, their children rather jump online to browse hundreds of schools at once. One of the largest virtual college tours is put on by CollegeWeekLive. The first event which took place last November attracted 15 000 students from 28 countries who “visited” 130 U.S. colleges. The events are highly interactive – there are live video sessions with admissions experts and counselors, live chat with current students, virtual speakers and video contests. The events also allow schools to set up virtual booths with brochures, videos, webinars, podcasts and live IM. Project Gutenberg, the longtime home of free eBooks on the web, has just introduced a mobile-ready version of their hosted content. Called PG Mobile, or Project Gutenberg's Mobile Edition, the software transforms the plain text of the files on the Project Gutenberg web site into a format that can be read easily on mobile devices with small screens. Online gamers in the market for a new job may want to skip any mention of “guild master” on their resume. How Much Trouble Can You Get in With 140 Characters? In Social Networks and Life-Changing Consequences, I shared a story of how an education student suffered unhappy consequences from a MySpace photo. The risks inherent in posting content to MySpace and Facebook are fairly obvious and well-documented. I hadn't really considered the risks associated with other web 2.0 tools such as Twitter and Friendfeed. It's startling to think that someone could get themselves in trouble with the 140 character limit imposed by Twitter, but that's just what this story warns of - Twitter Lawsuits: 4 Reasons Your Tweets Might Be Trouble. I wonder if photos you "favorite" in flickr or stories or posts you "like" in friendfeed could also come back to bite you. We're really in uncharted waters. the National Law Journal has warned that those 140 characters could land you in a courtroom. Interesting story from MIT's Technology Review. Here's a link to a video explaining memristors. Researchers at HP Labs in Palo Alto, CA, are betting that a new fundamental electronic component--the memristor--will keep computer power increasing at this rate for years to come. Memristors were first predicted in 1971 by Berkeley professor Leon Chua. They are nanoscale devices with unique properties: a variable resistance and the ability to remember the resistance even when the power is off. After rediscovering Chua's work, researchers at HP Labs built the first working memristor in May of this year. And last week, at the first ever Memristor and Memristor Systems Symposium, in Berkeley, CA, the same team showed how memristors can be integrated into functioning circuits. Their circuits require fewer transistors, allowing more components (and more computing power) to be packed into the same physical space while also using less power to function. "We're trying to give Moore's Law a boost," says lead researcher Stan Williams, a senior research fellow at HP, referring to a prediction made by Intel founder Gordon Moore that the number of transistors on a computer circuit (and therefore computer performance) should double roughly every two years. I've been reading a lot about the possibility of using the iPhone as an e-book reader. My friend Gordon Snyder is skeptical. So here's a little more on the iPhone and e-books. Consider the book Twilight, that spanned the current film of the same name that is so popular with teens and tweens. Twilight is available from Amazon.com for the Kindle e-book reader for $6.04 - as a wireless download. Of course you have to have a Kindle, another $350. Now for the iPhone. Twilight is available for the iPhone for $10.99 - almost twice the price. Of course you have to have an iPhone $199-$299 plus monthly bill. Battery life - the Kindle definitely wins here. Size - I would give a slight edge to the Kindle, but if you're comfortable reading on the iPhone, it's much more portable. Other functions (besides e-books). iPhone wins here. Kindle has a few additional features, but nothing matching the iPhone. 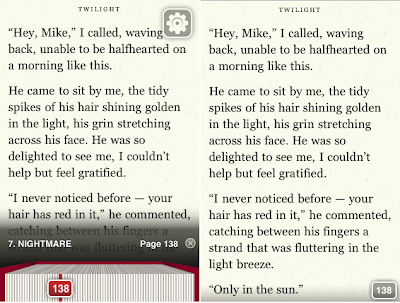 Here are some screenshots of Twilight on the iPhone. Notice that here, you're not only buying the e-book, but also the reader packaged with it. Looks like a slick interface with strong usability. Iceberg is our revolutionary new electronic reader. 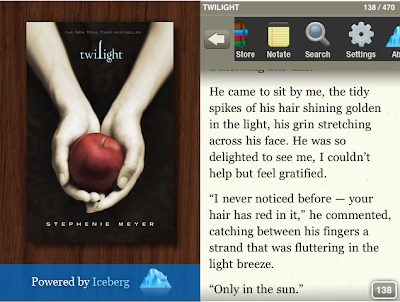 Iceberg brings the timeless experience of reading books to the mobile space, wedding the functionality of the iPhone to the feel and familiarity of books. Iceberg is different from all other existing electronic book readers – it’s the only one that replicates the actual experience of reading a book. It’s all done in an organic way that feels right to people who love to read. 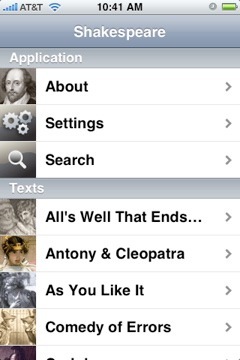 Each and every book exists as its own application right in iTunes. It’s the fastest, most convenient way to purchase books electronically. 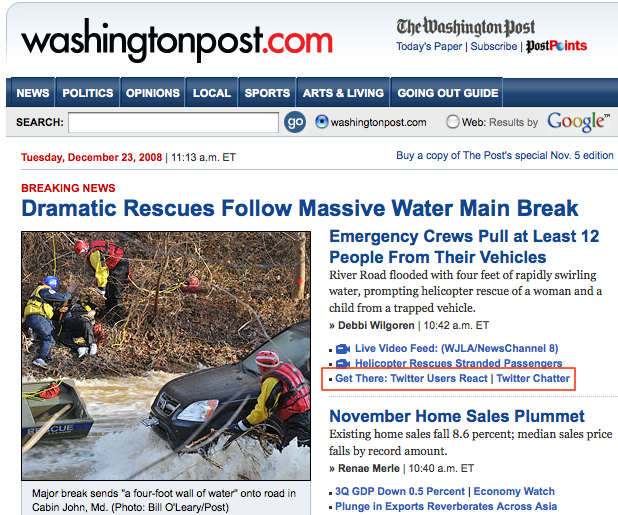 Iceberg maintains pagination. This means that every one page in an Iceberg book is equivalent to a page in a print copy of a book. Text can get bigger and smaller as readers pinch in and out. But Iceberg text reflows automatically so there’s no annoying scrolling across the page. Readers can search text, take notes and skim through pages, all in an organic and intuitive interface that readers will love. Iceberg also makes it easier and more fun than ever to discover and buy new books. 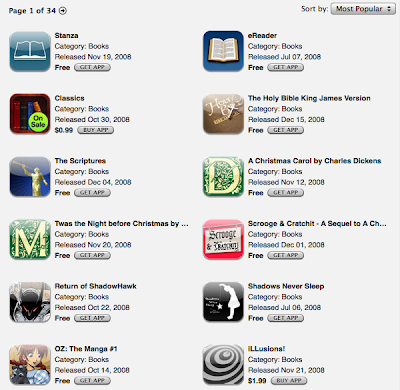 Each book acts as a gateway to other titles in the bookstore, which is located right inside of iTunes. Readers can buy books instantly, as soon as their interest is piqued. They can get books when they want them, wherever they are – anytime, anywhere. Here's snapshot of similar books available with the icebergreader - only 11 titles - not even close to the number of Kindle titles. Edge here - Kindle by a huge margin! There are more "books" available for the iPhone - many of them free, but even at that rate we're only talking 680 titles - just a tiny fraction of what's available for the Kindle. 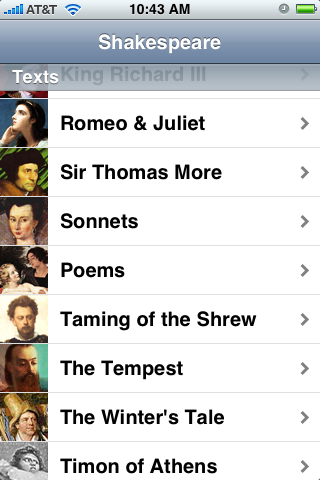 A little teaser for tomorrow - what if you could carry around the works of Shakespeare - all of them - on the iPhone - for free! OLPC in Action - "Think of the Laptop as a Vaccine"
Earlier this month, Nicholas Negroponte flew to Colombia, along with a team from One Laptop per Child, to deliver bright-green XO laptops to schoolchildren in territory once held by guerrillas. TED came along to film as part of a new, occasional feature called "TED in the Field" that offers updates on TEDTalks speakers and the initiatives, ideas and products they announced. Negroponte talks with TED about OLPC and what he's learned along the way -- and invites TED viewers to take part in the Buy One Get One program. Research In Motion Ltd. said today it will fight for its takeover bid for Certicom Corp., an encryption firm, after the latter sought a court injunction to thwart RIM’s purchase. Certicom said it would weigh RIM’s bid —RIM is offering Certicom shareholders $1.20 per outstanding share, which translates to $52.6 million for the company — but also evaluate competing bids. RIM said Certicom’s basis for an injunction — that the BlackBerry maker unfairly used confidential information to make its bid — was untrue and it would fight the allegations. RIM, based in Waterloo, Ontario, would bolster its security offerings by integrating Certicom’s encryption technology into its servers and devices. Certicom is based in Mississauga, Ontario, and is known for elliptic curve cryptography (ECC). More humor from Merlin Mann - the only time I hear Styx talked about is when watching That 70's Show. 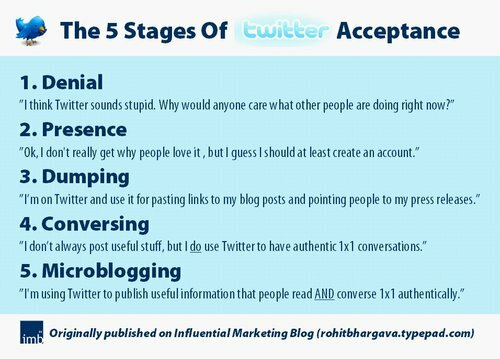 Here's a great slideshare presentation - "Twitter for Business." It's a little long (69) slides. some of the text is a bit small and it's tough to follow without a presenter, but if you mine your way through it, you'll find some great examples of how businesses are successfully using Twitter. Thanks to David Armano for sharing (on Twitter). If you have tried twitter and don't get it or simply haven't jumped in yet, here's a great post from Zen Habit's Leo Babauta explaining how to get started, as well as some great uses for twitter. You can follow on me Twitter and Leo on Twitter. Neither did I at first — I resisted using Twitter for more than a year because it seemed like just another distraction, just another way to waste time and have noisy chatter going on in front of you. But I decided to see what the fuss was all about, and did my Great Twitter Experiment. To my surprise, Twitter was actually fun, interesting, and useful — if used correctly. Great Charlie Rose interview with Malcom Gladwell, discussing his new book Outliers: The Story of Success. I watched the night it aired. Very interesting ideas on performance, success, opportunity and deliberate practice. I love the stories about Bill Gates in 1968 and the early Beatles. I love the line about the Beatles - "rock-n-roll grad school." The Gladwell interview is followed up with an interview with Geoff Colvin, author of a related, but less well-known book Talent Is Overrated: What Really Separates World-Class Performers from Everybody Else. Really good stuff! As an aside - I was really disappointed to hear that Charlie Rose had to let some of his staff go because of the down economy. Maybe he should put up a paypal donate button. Great video from Rutgers University's Chair of English - gotta meet this guy. Thanks to friend Lori Weir from Middlesex Community College in Massachusetts for sharing. 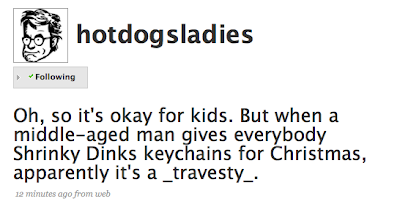 I have an account on digg and used to read/visit digg fairly regularly, but not very much lately. I spend more time in facebook, twitter and google reader. And a little in friendfeed. I guess the lesson is "sell while you're hot!" Bad news for digg's Kevin Rose, ontop of the closing of Twitter clone Pownce. Perhaps Digg really is the future of the news business. The headline-discussion site, once an icon of the Web 2.0 movement, is losing millions of dollars a year. BusinessWeek's Spencer Ante got ahold of Digg's financial statements. They are frightful, even for a startup. Last year, the company took in $4.8 million and spent $7.6 million, for a loss of $2.8 million. In the first nine months of this year, losses grew almost as fast as revenues: Digg took in $6.4 million and spent $10.4 million, resulting in a $4 million loss. At an annual clip, that's more than $5 million out the door a year. Keep in mind that Digg has a lucrative three-year advertising deal with Microsoft, that pays the site a guaranteed rate for its inventory. Without that arrangement, struck last year — driven, most believe, by Microsoft executives' desperation to get in on the Web 2.0 craze — Digg's losses would likely be far worse. Check out this super cool print ad that produces aa 3D version of a MINI, when exposed to your webcam. It's MINI magic. The video clip shows a black and white ad that ran in three German car magazines recently which, when viewed through a webcam via the Mini website, features a 3D holographic model of the new automobile sitting on top of it! Readers can twist and turn their magazine to view the car from every imaginable angle. On Dec. 11 the American Council on Education sent a letter to the Federal Communications Commission protesting a change in something called the “universal service fund.” The fund, run by the FCC, is used to subsidize service in rural and low-income areas, providing customers affordable rates. The change, proposed by telecoms AT&T and Verizon, would charge institutions 85 cents per assigned telephone number, according to an earlier letter drafted by the council. Previously, colleges were charged fees using a formula based on their revenues. The Association for Information Communications Technology Professionals in Higher Education has estimated that, with the new fee-per-phone number plan, higher education’s contribution to the fund would jump from $60-million each year to approximately $450-million. The average college or university would pay about $100,000 annually. Try the sample for Southern California - I got the first 9 or so map pages in my sample. Not that I felt it was that useful, as it didn't appear that the plates could be further drilled into, to get any street level detail. Thanks Karen! I'll do that and post some screenshots. Two great figures, from David Armano, to either jazz up a presentation or jumpstart your brain! View or subscribe to his flickr photostream or read/subscribe to his blog. Every day, hundreds of articles appear in academic journals and very little of this information is available to the public. Now, RNA Biology has decided to ask every author who submits an article to a newly created section of the journal about families of RNA molecules to also submit a Wikipedia page that summarizes the work. As Nature reports, this is the first time an academic journal has forced its authors to disseminate information this way. The initiative is a collaboration between the journal and the RNA family database (Rfam) consortium led by the Wellcome Trust Sanger Institute. Every new Wikipedia page will go through the same peer review process as the original article, though afterward, of course, the pages are open for editing just like every other page in the Wikipedia. Here's a great approach to addressing the difficulty that technical students have with math courses. Dan Hull is the Director of OP-TEC, the National Center for Optics and Photonics Education, which is funded by the National Science Foundation's Advanced Technological Education (ATE) program. I think this approach - creating a discipline specific math supplement that connects the technology, which the kids love, to the mathematics - could benefit any of our technology programs. OP-TEC: Math in Photonics Education: It all adds up. Faculty at colleges tell me that most of their students love to work with lasers and optics - they’re not dropping out from lack of interest; they’re dropping out because they are struggling with the math. A few years ago, Gary Beasley, lead instructor in lasers and photonics technology at Central Carolina Community College (CCCC), was losing over 60% of his students in the first semester - mostly because of the math. So, together we began working on that problem. Then we developed a math supplement titled Mathematics for Photonics Education. In it we included a chapter for each of the eleven topics. Each chapter has a 2–3 page review of the math concept, followed by several pages of example calculations for problems that students typically encounter in photonics courses. The remainder of the chapter consists of exercises for student practice. We also prepared a diagnostic test that Gary (or any photonics professor) could administer to students who were beginning their first courses. The book is not a math text - it is a supplement that every new photonics student can own and keep for reference throughout the duration of his or her work at the college.